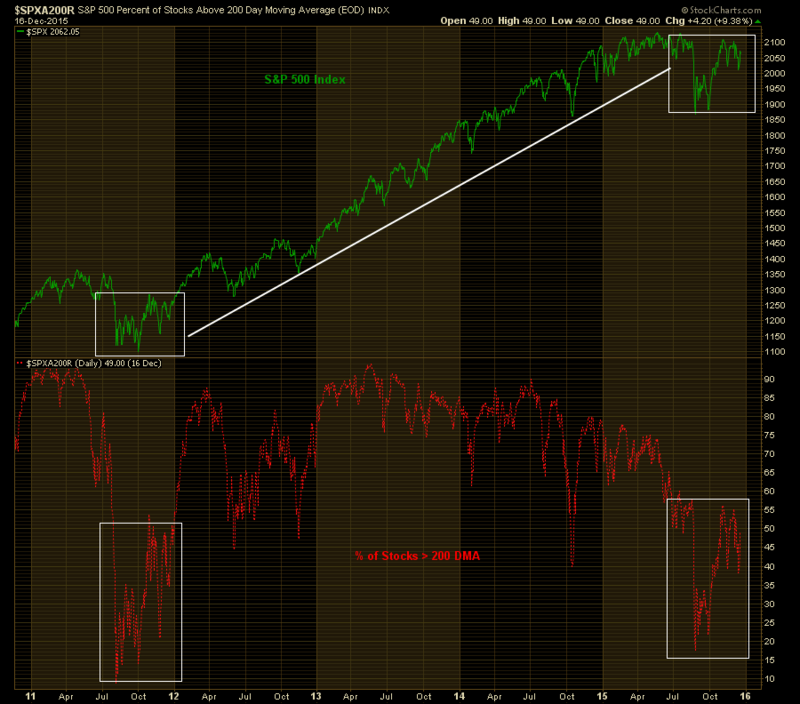 Comparison Between the S&P 500 Index in 2011 and 2015. 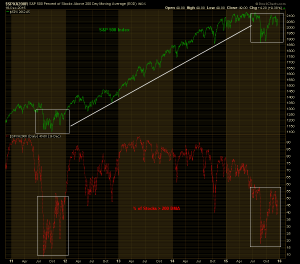 This chart takes a look at the S&P 500 and the graph of the number of stocks in the index above their 200 day moving average in late 2011 compared to today. In 2011 the index dropped sharply in August bottomed out in September and struggled into the end of the year to make new highs. 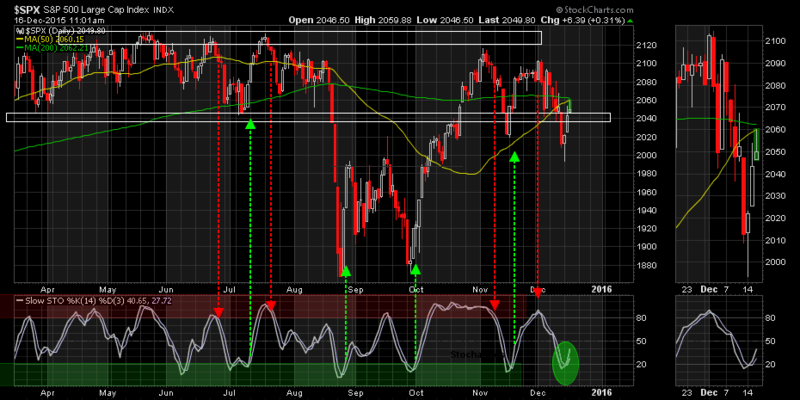 That pattern seems to be playing out again on the S&P chart over the last three months. At one point in 2011 only 10% of the stocks in the S&P 500 were above their 200 day average, but what followed was a two-staged recovery process that eventually saw the ratios moderate. 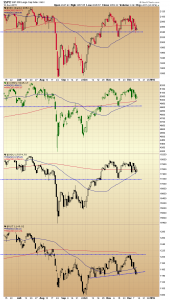 The number of stocks below their 200 day moving average has been in bearish divergence to the index this year, but again that constructive double tiered action has been playing out over the last three months. History doesn’t always repeat and it probably won’t this time, but it would be nice if it rhymed. Here’s a link to my article on Dunkin’ Brands (DNKN) published on TheStreet this morning. 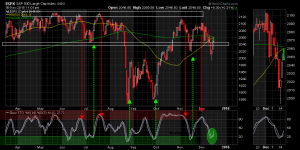 S&P Sitting on Its Hands? Looks like the S&P 500 has decided to sit on its hands and wait for the Federal Reserve statement, while positioned just above the channel support line from earlier in the year and just below the intersection of 50 and 200 day moving average resistance. Nice spot. 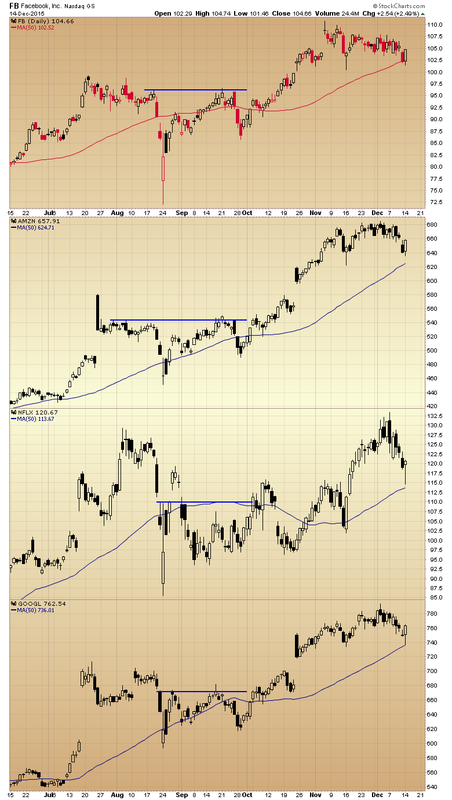 Here’s a link to my article on Wal-Mart (WMT) published on TheStreet this morning. I don’t know if the economy is improving or not. I’ve heard credible arguments that interpret the employment, housing and manufacturing numbers in opposing ways. To my thinking, it should not be a matter that requires discussion after over five years of Federal Reserve zero interest rate policy. The economy should be improving after that level of effort and it should be clear, but it is not. Interestingly, a modest rate hike satisfies both sides of the economic argument. The “statistics are good” camp will see it as an acknowledgement by the Federal Reserve that the economy is improving and an attempt to get ahead of the inflation curve, and the “statistics are being misinterpreted” side will accept it as a positive because it will give the central bank room to lower if we go into another recession. A win and “kind of win” situation. 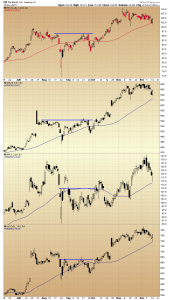 The FANG stocks formed strong hammer candles on their daily charts, at or just above their 50 day moving averages. Here’s a link to my article on The Home Depot published on TheStreet this morning. The message of the market today was not modest gains at the close, but rather a sharp pullback from much higher levels earlier in the session. 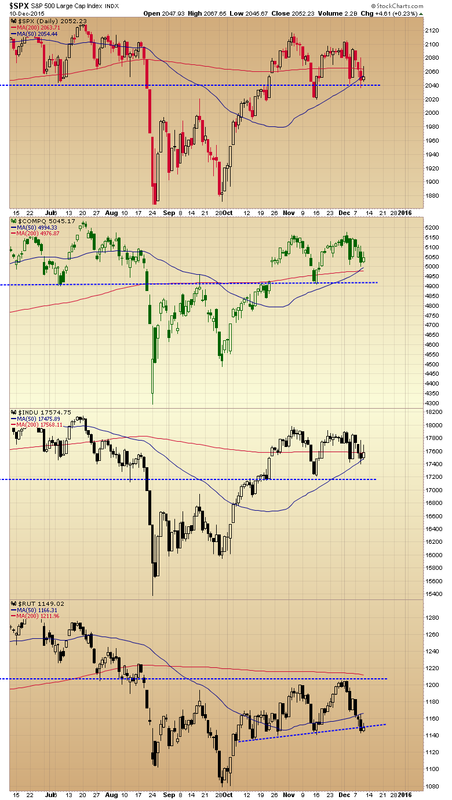 This action created high wick bearish candles on the daily charts of the major indices, just above or near important levels of trend line or moving average support.